This beautiful waterfront home is perfect for your next vacation in paradise. With three bedrooms, three baths, a full laundry room, and heated pool you’ll never want to leave. With its southern exposure the pool is under the sun all day, perfect for all those who love to bask in the sun. There is an open floor plan around the pool as well as a full bath in the pool area. The screened in lanai has a sunbathing area with lounge chairs, as well as a shaded sitting area, and a dining area by the water with a propane grill. Manatee frequent this canal that has direct access to the Marco River. Many species of fish can be caught right off the dock with the fishing poles provided, and there is a cleaning station located on the dock. You also have the option of bringing your own boat or renting one and mooring it at your own personal dock. All of the bedrooms have televisions and the living room has a large flat screen TV with a DVD/VCR player. Wireless Internet works throughout the house and pool area. Bicycles are available for your use as are beach chairs, beach towels, and pool/beach toys. Marco Island is six miles long and four miles wide, with over 50 locally owned and operated restaurants. There a movie theater, shopping and beautiful white sand beaches only minutes away. Day trips to the everglades are really fun as is a boat trip on the Key West Express right from the Marco Marina. Sunset dinner cruises are also enjoyable. Packing is easy; all you need is a bathing suit, suntan lotion, and a good book . We have been coming to Marco Island for family vacations for the last fifteen years as my parents own a home there. We visit Marco Island when school is out, on Holidays and summer breaks. We all love it there and have such happy family memories. We have been looking for the last five years to buy a home and found this home last April. We love be around the pool, it is fun to sun, swim and eat outside. Even on a rainy day we can sit under the covered lanai and enjoy the fresh air We live in the north and do not get to be outside a good portion of the year, so this is very enjoyable to us. We also love to go bike riding and spend days at the beach. There are so many nice restaurant close by which we enjoy frequenting. Even when we have to work on the computer, we have wireless internet and can sit out by the pool. From the porch we also enjoy watching the fish dolphins and manatee that frequent our canal. (4) There are four TV,s ,one in each bedroom and one in the living room. We had a great stay. The house is warm, inviting, and well kept with all the comforts of home!! The weather was great, so we spent most of our time outside in the area by the pool. You won't go wrong with this rental!! Thank you for a delightful stay in your lovely home! It was perfectly located on Marco Island, the price was right, and everything in perfect working order. We were pleased to receive a phone call from Dawn shortly after our arrival to make sure everything was ok, and we also received another phone call the day before we left to wish us a pleasant trip home. She couldn't have been kinder or more helpful! We are so looking forward to booking again next year! If I could design a vacation spot it would look exactly like this rental. If I could design a landlord they would be exactly like these folks. My contact with the owners has only been through the lovely wife and she is just a treat. When there has been a maintenance issue (and what Florida residence doesn't have them) the problem has been looked after immediately and cheerfully. The photos in this listing are very good but they didn't quite prepare me for how large the unit actually is. All this space is wonderful. 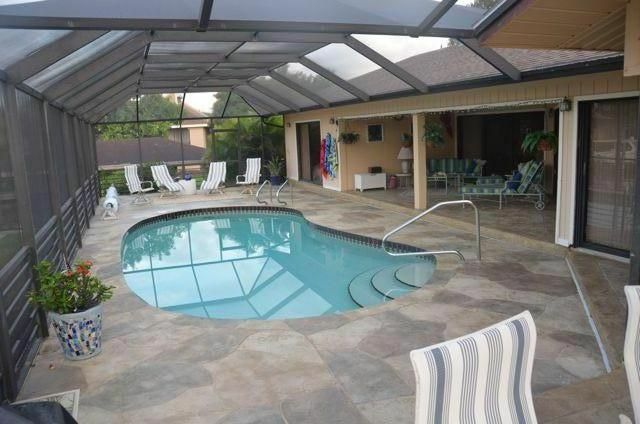 The pool is very comfortable and the covering lanai encompasses the entire back end of the house. So roomy and and quite glorious. This home was immaculate when we arrived and even the garage floor looked clean enough to eat off. I won't describe the house as the photos are all you need and they represent the house perfectly. The landlords have supplied us with wonderful wireless internet service which I am using to write this review. The also arranged the daily newspaper which keeps us up to date with the local news. I will say that everything works as it should and there seems to be nothing lacking for a wonderful stay. I think the best proof of our satisfaction is the fact that we rented this unit for Jan 2014, thus putting our money where my mouth is. What a wonderful place to add to our families memories. We had a party of four adults as this wonderful home. The home was extremely clean, beds extremely comfortable and very well equiped! We throughly enjoyed the updated kitchen as we even cooked a turkey and held an early Thanksgiving dinner with four additional family memebers. The home was so comfortable we had a hard time pulling ourselves away to enjoy some of the other local sites. In addition we put the bikes to good use and toured the island on a daily basis. We would highly recommend this home to anyone visiting the area and we hope to return someday in the future too.